Once you’ve determined that in-home care is the best option to keep your senior loved one safe, healthy and socially engaged, you may run into a stumbling block when it’s time to bring your loved one fully on board with the idea. Many seniors balk at the thought of bringing a “stranger” into the home, or in having their routines disrupted. Begin slowly – and early. Don’t wait until the care need reaches the emergency crisis stage. As soon as you begin to notice small changes in your senior loved one’s daily living abilities, gradually and gently begin to initiate a discussion about future needs and your loved one’s wishes and goals. Keep it calm. 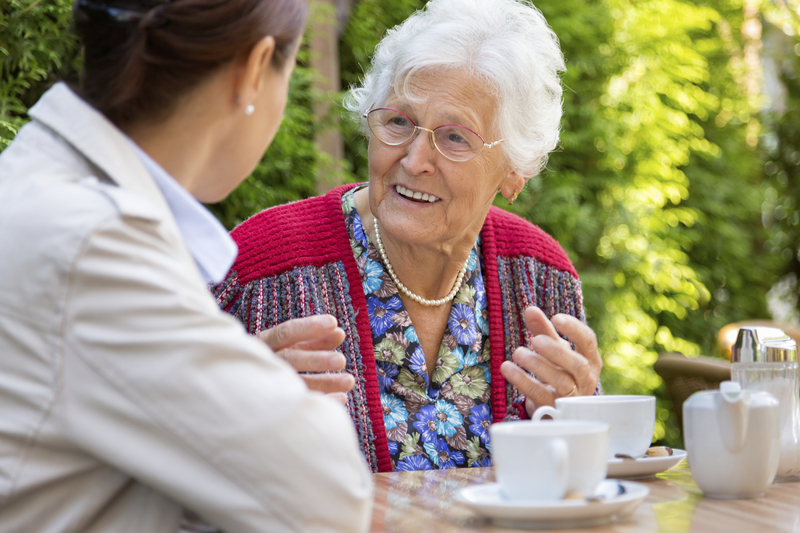 Pick the least stressful, most relaxed time of day to discuss the option of home care in more depth. Broaching the subject at the end of the day as you’re rushing to get dinner on the table, when everyone is hungry and tired, will probably bring about less than desired results. Try and try again. If your senior loved one agrees readily to the need for in-home care the first time you raise the discussion, you’re in the minority. Most seniors will resist the idea initially, but don’t give up. Shelve the topic for now, and then try again. Listen and offer respect. Just because your senior loved one may be ill, it doesn’t mean he or she is unable to make decisions affecting his or her care. As long as safety and health aren’t being compromised, honor his or her wishes, while continuing to touch on the subject periodically over time. Safety first. However, if your loved one is at risk due to health or safety concerns, enlist the aid of a medical professional to ensure that these concerns are addressed and proper care is in place. While the path to accepting the need for in-home care may be challenging, once implemented, even your senior will likely agree that having the assistance of a professional caregiver, such as those provided by Hired Hands Homecare, can make all the difference in his or her quality of life and wellbeing. Call us today to schedule a free in-home assessment and allow us to answer any of your questions about our top quality California senior care services! Luckily my mom’s family did the right thing and didn’t wait until the emergency stages of my grandma’s life to find an in home care service to come in and take care of her. She is getting to that age though and sadly we can’t always be there to take care of her. That is why they are deciding to go with the in home health care, that way, she will always be with someone and can be monitored 24/7. I hope that we can use these tips to find the right service to come in and help take care of my grandma. My mother is getting old and needs in home help. Thanks for the advice about keeping it calm and bringing up the topic in a relaxed time of day. Hopefully, we can get my mom to agree so that we can get a nurse to help us take care of her. I am so glad that I came across this article! My husband and I have been thinking about hiring someone to come and help take care of my mom because we both have really crazy work schedules. I think that these tips will really help us start the discussion with her, thanks for the information! I really like your tip about listening and offering respect when it comes to looking for in home care. My husband and I have been thinking about getting some in-home care for my mom but we haven’t really known where to start. I think that these tips will be really helpful in getting through the process. Thank you for sharing! My mother, who is 85 years old recently told me that she wants to be but in home care this summer since my dad passed away last December. It was wonderful to know from the page that just because your senior loved one may be ill, it doesn’t mean he or she is unable to make decisions affecting his or her care. I will be sure to talk to her more about this to make sure that she is certain that she wants this! As my mother is getting older, my siblings and I are wanting to make sure she is being cared for even if we are not there to help out. We are wanting her to stay in the house that her and my dad built, and have heard a lot of people suggest we hire a home health nurse. But before we agree, we want to make sure mom agrees to this. I like how you said that we start discussing this early with her just in case her health declines faster then we expect. That way she will feel like she was a part of the choice. Thanks for the insight! My grandmother has been having a hard time taking care of herself recently. My family has been thinking about getting her some type of in home care, but we aren’t sure if she will like that idea. So, I liked that you talked about how it would be smart to keep the conversations calm. I am glad to see such an amazing post about home care. Would you please write something about hiring a home care expert? We’ve been wanting to find some elderly care options for my grandparents, and I think that getting some tips would be good. I’m glad that you talked about trying over and over to make sure you find the right elderly care for them. I’m going to have to see if I can find some good elderly care, and keep trying until we get it right! Thanks! I like that you mentioned putting safety first. My dad is looking to get in-home care for my grandpa but wants tips. I’ll be sure to talk to him about just finding a professional and being safe about it. I thought it was interesting that you talked about making sure safety is a top priority. My dad is looking to get some senior care for his mom since she’s getting pretty old. I think I will talk to him about making safety a top priority. My mom is a bit older, and she’s been having some health problems lately. I’ve been trying to help her, but I don’t think that I’ve been able to help her like she needs. So I appreciate that you say that providing ongoing care for seniors is difficult and you should accept professional help if you need it. I’ll have to find someone who does senior care who could help me help her. Thanks for the tip to pick the least stressful and most relaxed time of day to discuss home care with your parents. My parents recently retired, and with my dad’s medical condition keeping him at home more and more, I think it might be time to discuss nursing with them. My family often visits them Sunday afternoons for dinner, so maybe that would be a good time to discuss the idea of getting them professional help through home care services. As your parents get older, they may begin to move more slowly or forget what they are doing. Depending on the state of the health, they may begin to lose strength. Learn to be a guiding hand and reassure them that things are going to be okay. I like your suggestion of talking to our senior loved one as soon as we notice small changes in their behavior. I think my mother will probably need senior care soon, but she can be a bit feisty so I’ve been nervous about having the discussion with her. Now that I know I shouldn’t put it off till it’s urgently needed, I’ll definitely take your advice and start preparing for the conversation now! Great tips! While I agree it can certainly be very difficult for a person to accept that they need home care. But sooner or later I think every aged person needs home care and approaching them in the right way for home care is necessary. Thanks for sharing this wonderful article. I know hiring a home care agency is the best solution for caring for our elders. Maybe some elders feel uncomfortable with unknown people at home. But if we make them ready and discuss with our family they support us and understand its need. Your article defines every point cleary. You did a great job. Great article, thanks for sharing. Getting a senior loved one to understand what’s best for them can be very difficult for the family. Having a proper discussion is helpful. Really glad that I read this article at the right time. I was planning to hire a caregiver for my granddad due to my tough schedule. Thanks for the tips, really appreciate it.